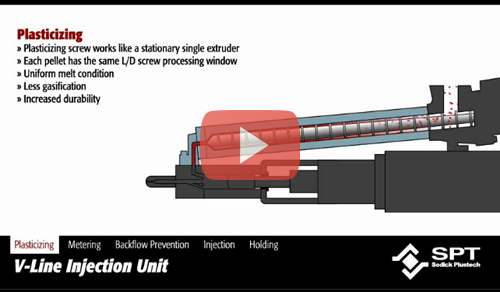 Sodick utilizes a proprietary two-stage V-LINE method for plasticizing and injection functions. These proven concepts allow for consistent shot volumes and melt densities when compared with standard designs. 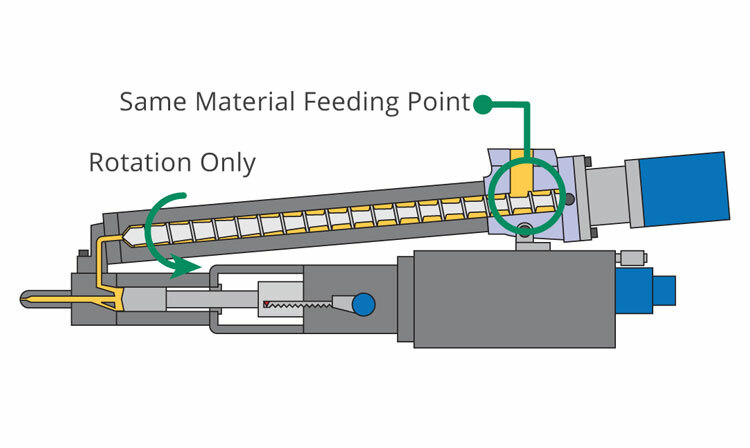 Unlike conventional in-line reciprocating screw system, the V-LINE plasticizing screw remains stationary during material transfer, minimizing axial wear and ensuring a consistent heat profile for each pellet. 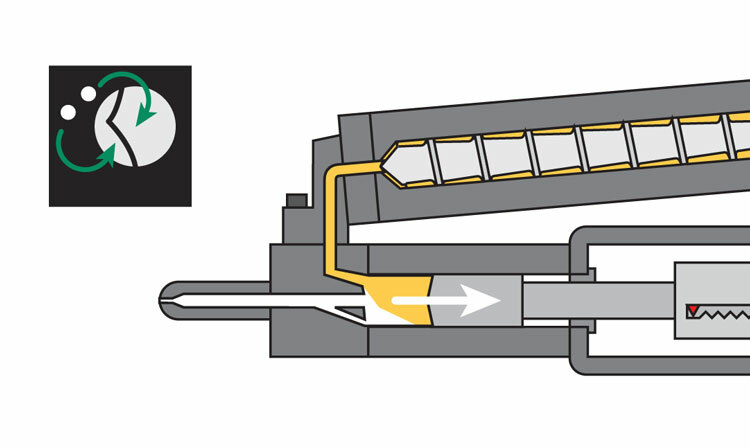 Due to this unique design, screw functions are limited to material transfer and consistent melt densities into the injection chamber. Upon completion, the injection chamber is sealed by a hydraulic cylinder pushing the screw forward approximately 1.5mm, thus eliminating any back flow of material. Each pellet goes through the same thermal exposure by stationary screw rotation. Processing material is not affected by injection. 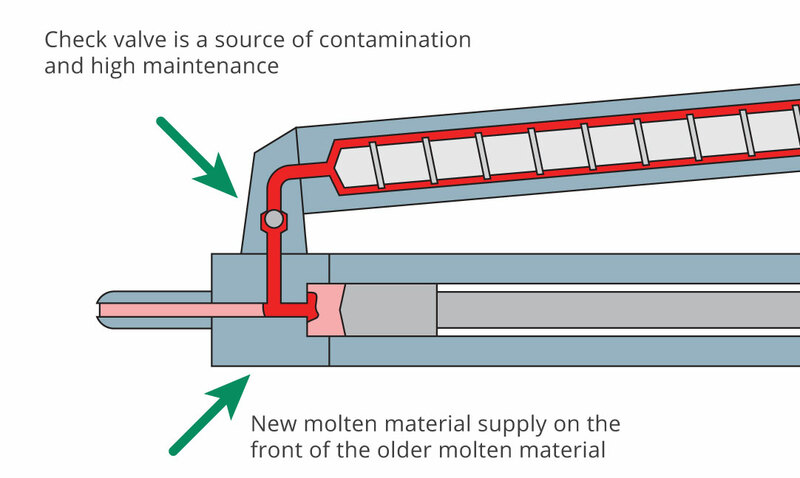 Ideal melt quality is preserved by front loading the plunger cylinder with a refreshed supply of new molten material for each subsequent shot. Since metering is done by mechanical actions, metered material density is stable with minimum influence of resin condition. There were inherent issues in the standard, old two-stage system. The V-LINE® System overcomes these issues. 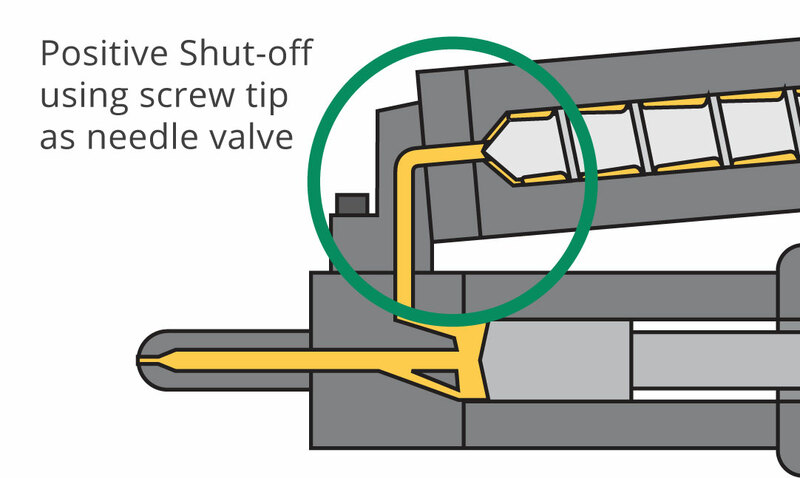 V-LINE ® Two-Stage Injection System eliminates the check ring. 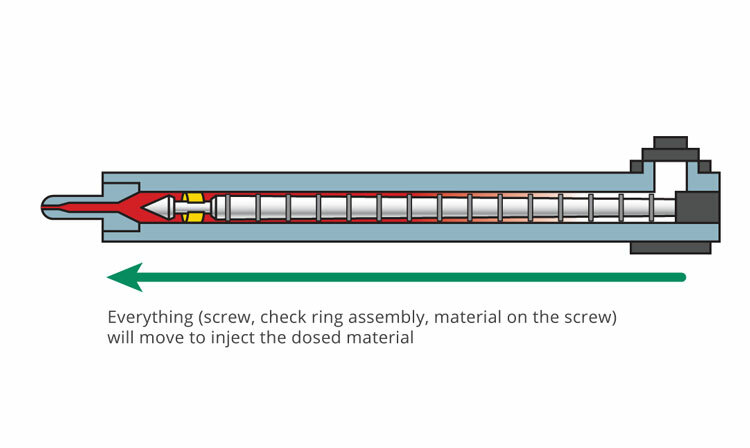 Prior to injection, the plasticizing screw is indexed forward creating a positive shut-off (EXACT DOSING). 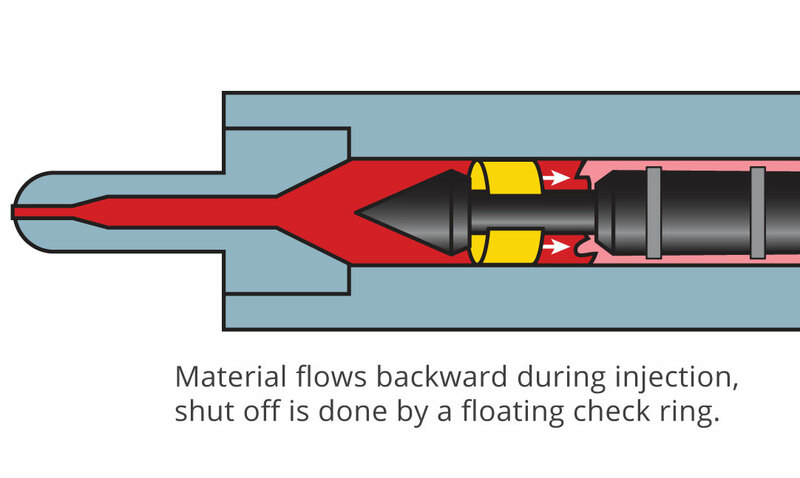 This action prevents any opportunity for back flow of molten material back into the melt. Check ring’s close timing occurs at injection (inconsistent). 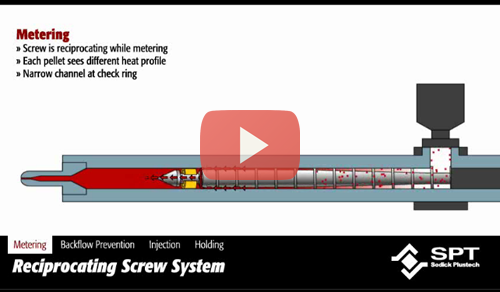 Screw tips are a source of frictional heat, material hang-ups, intermittent malfunctioning. The V-LINE injection is controlled by a closed loop system which monitors actual speed vs. set speed and maximum melt pressure. 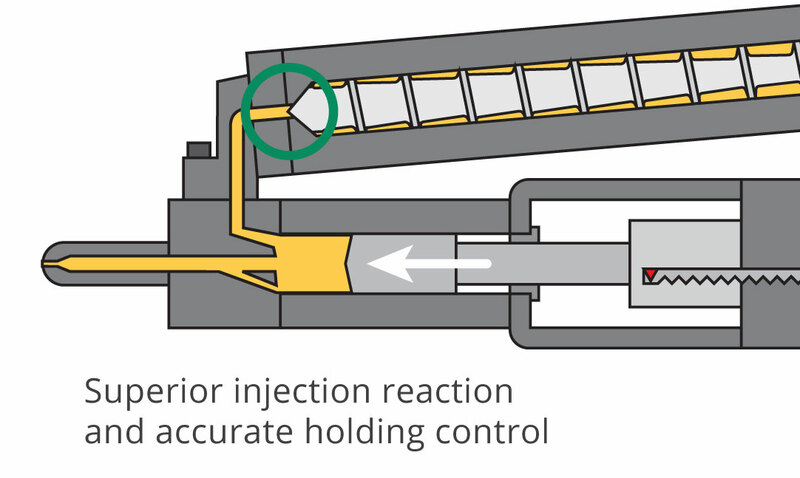 A linear encoder detects plunger position and a pressure sensor monitors injection pressure. User selectable limits can be easily input on the process monitor screen. 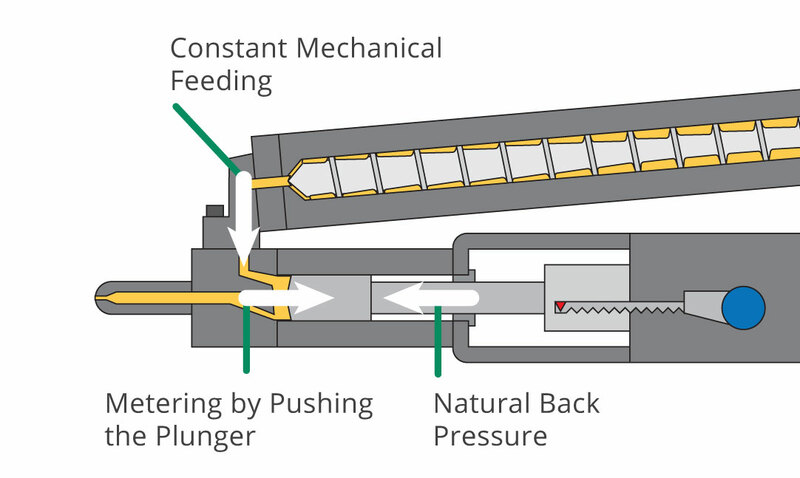 Once the exact amount of material is transferred into the injection chamber, the injection plunger is retracted via the melt pressure and is returned to a set position. This design eliminates the need for a check valve, which is a primary source of material degradation and shot volume inconsistency. The exceptional speed of the controller provides real time response during injection and records the melt cushion in 0.001″ for accurate process stabilization. V-LINE® decompression function is very effective since the dosed material is encapsulated in the plunger chamber like a hypodermic syringe. 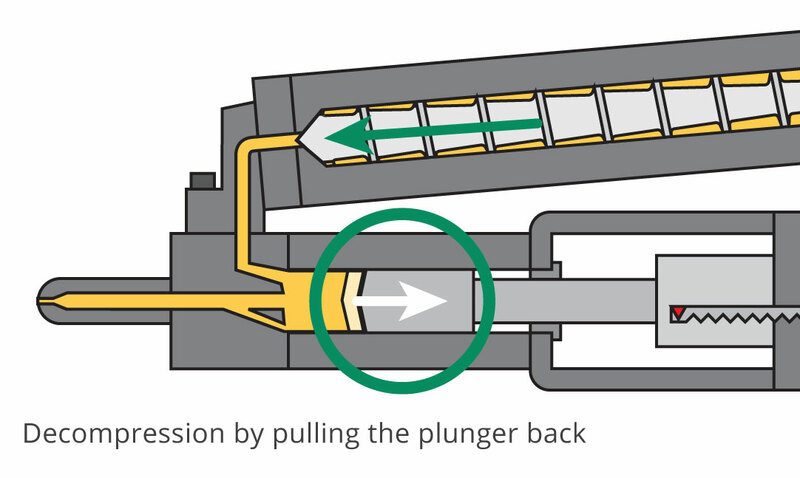 V-LINE® Plunger Injection is very reliable due to high response, low mass and low inertia mechanism. There is always speed and pressure loss at injection because of leaked material. While leaking, the metered material is exposed to high shear heat which generates degradation and gas. Our unique technology is what separates us from the competition. Our V-LINE Two-Stage Plunger System works in perfect harmony with the Hybrid Direct Clamping System and Advanced Multi-Functional Controller to achieve ultra precision, repeatable molding.